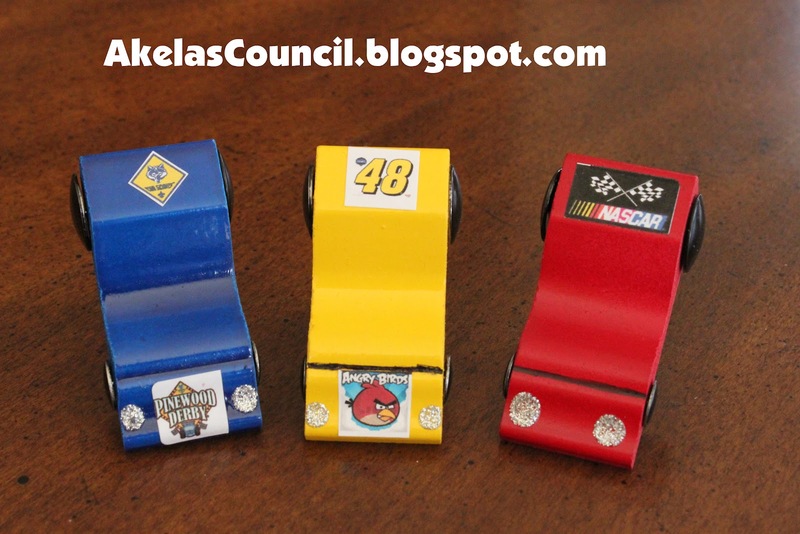 These are pinewood derby cars made out of moulding. I went to Home Depot, and bought a 7 foot long piece of moulding for about $4. I cut it into sections (I got about 75 cars out of the 7 foot long section), and spray painted the sections. At Walmart, I bought two different sizes of thumbtacks (one in the office section, and one in the fabric section), but they were silver, so I spray painted them black. I looked online, and found some logos I thought would be fun and printed them up on 1/2 inch x 1 3/4 inch white labels (80 per page). It ended up making LOTS, but that is good. 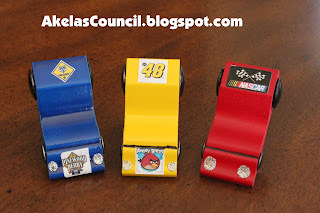 I was able to put 2 - 3 logos per label - that made them super small, and then I decorated the cars with the labels, and put the thumbtack wheels on (bigger in back, and smaller in front), put on a PVC pipe slider back with a glue gun, and added a little glitter glue for headlights and tail lights. This turned out to be a really cheap way to make lots of neckerchief slides. Pin us to your board! Oh. My. Goodness! 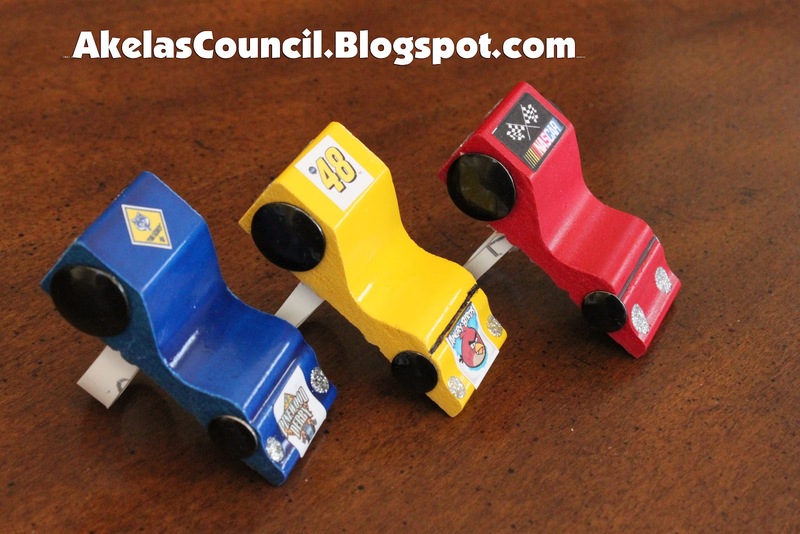 This makes me want to do cub scouts again. So creative. Thanks! They "kicked" me out too, so I volunteer at Roundtable now. Lots of fun! These are perfect for our pack. 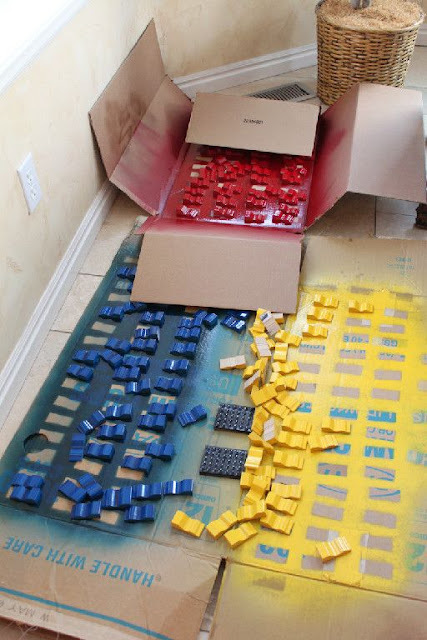 I want to make these but I can't seem to find any moulding at Home Depot that resembles this. Can you pass along any more info like moulding style or size that might help me locate it. Thanks!!!! I bought mine at Home Depot. It was the regular kind of mounding. I looked at mine in the garage, and it didn't have a name, but the number on it is 7 77123 07559 7. Maybe you could have them look up the number and show you. It was the kind that was already primed white. Good luck with your project! They are super easy, but take a little while to get enough coats of paint and then time to dry completely. I don't know if you'll get this, but by any chance did you save the document with the logos on it?